Opened up her second season with Arkansas with a third-best overall performance at the Cowboy Duals (Sept. 1), where she also improved on her personal best with a time of 10:39.70 … Following that, Nichwitz had the sixth-best time for the Razorbacks at 21:01. 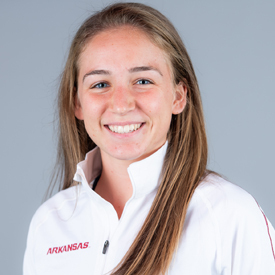 05, good enough for 24th overall at the Riverside Invitational (Sept. 17) … Continued the season with a 23rd overall performance at the Chile Pepper Festival (Oct. 1) clocking her time at 17:14.10, a personal best, 11th best for the Razorbacks … At Pre-Nationals she finished 5th overall in the open section 6K with a time of 21:44.70 … Nichwitz competed in the SEC Championship, assisting in Arkansas’s first place victory with a 28th overall 21:22.90, good enough for Arkansas’s ninth-best time. Crossed the line in 10:44.1 to finish fourth in her first meet with Arkansas at the Cowboy Preview (Sept. 1) … Finished fourth against Tulsa and Oklahoma in dual meet competition and ninth overall at the season opener … Competed in the UC Riverside Invitational finishing third overall (Sept. 12) … Placed third for Arkansas posting a time of 17:33.80 … Raced in the Missouri Southern Stampede placing eighth (Sept. 19) … Posted a time of 17:30.78 finishing fourth for Arkansas … Finished 29th for Arkansas in the Chile Pepper Festival (Oct. 3) … Crossed the line in 17:14.90 setting a personal record in the 5K … Raced in the Wisconsin Adidas Invitational B-Race (Oct. 16) placing 16th overall and fifth for the Razorbacks … She posted a time of 21:37.80 on the course in Madison, Wisconsin … Finished 42nd at the SEC Championships (Oct. 30) with a personal best time of 21:07.50 … Nichwitz almost matched her personal record at the NCAA South Central Regional (Nov. 13) running to a time of 21:07.60 … She finished 40th overall on the 6K course and 7th for the Razorbacks. 13-time All-State in cross country and track & field … 2013 Foot Locker Nationals finalist … State runner-up in the 1600-meter run, 4×800-meter relay and with her team during the 2014 outdoor season. Born on March 25, 1997 … Daughter of John and Liz Nichwitz … Has one younger sibling, Rylee … Majoring in kinesiology … Hopes to make an immediate impact on team in her first year as a Razorback.